Spoons should not roll, but should have a side-to-side swing motion. If it’s rolling, slow down your troll or retrieve (or check for weed on the hook). If adding your own preference of hook (the hook weight will change the action – heavier beat with heavier hook), the point of the hook is traditionally on the same side as the dish of the spoon, but they work the other way too. Tomic spoons now come rigged with a swivel at the hook end which the hook is attached to, so orientation is not important when there’s a swivel. Some fishermen prefer spoon hardware the traditional way, so we still send spoons out with no back swivel when requested – so you’ll see them both ways. More spoon hardware detail is found on the spoon page. 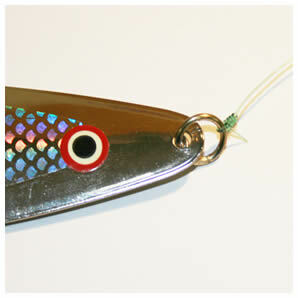 To attach a treble instead of a single hook we suggest using a spit ring. You may wish to vary your leader length and line diameter, as different combinations will produce different actions. A lighter line and longer leader will allow for more action. Spoons will have a different and more aggressive action if the leader is tied directly to the ring. You may leave the swivel dangling and tie to the tow bar instead of removing the swivel if you wish, so both options are always available. 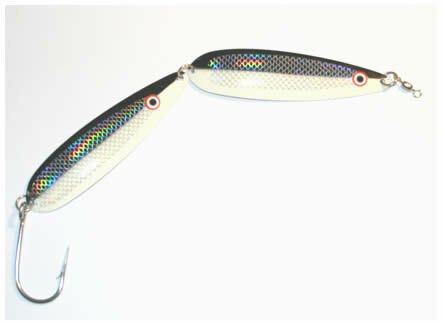 Spoons may also be rigged together using a split ring like the picture below. This is particularly useful when the bait is very large. A hoochie can be added to the hook like the picture below to add some extra flash. The trick is to trim the nose of the hoochie off so the hole is bigger to work with.